The stupid government seized my penthouse, as it was apparently owned by freaking ISIS! I was forced to live with everyone else (except Mother, who knew everyone's assets were in danger and protected herself) in this strange Addams Family house. Mother somehow arranged a deal for 20kg of our cocaine in Miami so Lana, Pam, and I had to go down there and sell it. Krieger made the cocaine look like a full-body cast, which Pam looked way nervous wearing. With Cyril acting as our lawyer/money laundering CPA, what could go wrong? Pam sawed off her casts as I kept Lana from freaking out over this silly drug deal. Just as I explained how we were the A-Team meets Scarface, I catch Pam eating her coke-casts! She knocks me out against the bathroom wall. I can't fight that, let alone that on coke. Lana and coke-strong Pam took me to an old friend, Ramon, who we did a mission with a while back. He fixed me up and explained the buyers... or rather, didn't. They turn out to be hitmen whom we've dealt with in the past, and they totally screw us, taking the money and the coke. 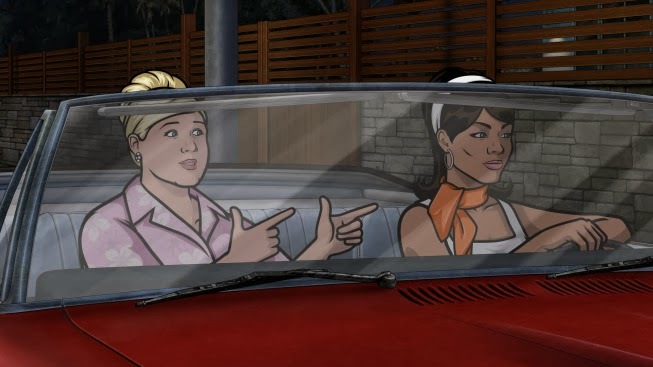 Lana pulled the pregnant card when we were gearing up to go after them, so she waited in the car with still coked-up Pam. Apparently, the hitmen had already sent the coke off to someone but still had the money. Ramon got into a shootout with them and everyone shot each other. Lana came in to 'rescue' me needlessly... and saw nothing. Back at the house of Lurch, we discovered the money is fake and Lana thought the three gay guys set me up... Nah. They're dead.